Let us pretend that inspiration is a solid, palpable thing every bit as real as the magazine in your hands. Tiny atomic kernels of the stuff, equal parts red-hot daring and cool-blue pragmatism, buzz idly through space, seemingly random and directionless, but resolute in their pursuit of the ideal mind in which to embed themselves. Most often they miss — think Betamax and Biopace — but every so often, through some miracle of happenstance, they hit the right brain at the right time. These fragments don’t provide the flashes of brilliance so popular in Hollywood movies. What they do provide, however, are brief moments of clarity that are needed in order to bring years of abstract toil and tedium into the realm of the feasible. While they are inevitably attracted to a certain type of mind, their arrival is not always perfectly timed. For an idea to return, it must first have departed — whether through neglect or outright rejection. And while it would seem that any idea worth bringing back to life would have been worth keeping around in the first place, that isn’t always so. Innovation is born of the spadework of its inventor, and the persistent shoveling of other inventors in the same field at the same time. It must fall in line with existing technology and with the current needs of the consumer at whom it is aimed, while also exceeding the expectations of both. Should inspiration strike too early, or too late, an idea will burn out, no matter its brilliance. The following pages are dedicated to sparks of inspiration that have returned, offering deja vu moments. Conceived years ago, dismissed or forgotten, they have been re-engineered and repurposed from their origins to fit into the modern world. They were ideas before their time; but their time has come. The lure is undeniable. Changing gears on your bike with the same effort it takes to change the channel on a television — who wouldn’t want that? It would put an end to long evenings in a dimly lit garage snaking new cables through thin housing. Given the allure, it’s not surprising that the industry’s keen minds have spent well over 20 years trying to perfect electronic shifting. Early efforts came well before the modern servomotor and advanced lithium ion batteries. They melded electronic and analog and, frankly, didn’t really work. The first spark of inspiration came in 1984, striking Bruce Browning, grandson of the mind that bore the Colt 45 and numerous other famous firearms. Browning tinkered and fiddled, aiming to improve on the shoddy front shifting that was unavoidable at the time. As his project began to bear fruit, component giant SunTour came calling, and the system became Browning Electronic AccuShift Transmission. The associated acronym, BEAST, was a perfect parallel for a mechanism both powerful enough to shift front chainrings under full load and prone to untamable failure. The electronic front shifting operated like a railroad switch, with the chain taking the place of the train. A hinged section of the chainrings would move inwards, pick up or drop off the chain, and then return to its normal position. The astonishingly high cost of the system, and aforementioned spotty reliability, killed the BEAST before it ever had a chance to strut its stuff. Within the next decade, Mavic took two separate swings, introducing its wired Zap drivetrain at the 1992 Tour de France and then the wireless Mektronic in 1999. For both versions, the French company applied electronics to only the rear derailleur, using a ratcheting push rod design and deriving shift power from the movement of the chain itself — a necessity given the poor battery technology of the time. That bit of brilliance was also the system’s downfall, as shift speed correlated with chain speed and the design resulted in exceptionally poor chain retention. The ill-fated attempt at making the system wireless resulted in ghost shifts caused by interference. Coupled with hoods so large that the UCI banned them, citing a rule prohibiting extra hand positions, Mektronic was assured an early demise. Had they been manufactured with modern motors and batteries, there’s no reason to believe the ingenuity displayed by Mavic’s engineers wouldn’t have translated into a stellar drivetrain. The ideas were, once again, conceived a bit early for proper execution. What-ifs aside, the history books will tell the tale of Shimano’s 7970 Dura-Ace Di2 group (pictured) as the first to hit the mark, falling as close to shifting perfection as the world had seen when it arrived in 2009. Di2’s wired transmission removed the spotty reliability of Mektronic. Powerful and precise motors are used in both the front and rear derailleurs so every push of the button results in near-perfect movement, and the front derailleur can be shifted easily under pedaling load. Small, advanced batteries keep the system going for thousands of miles, and keep the weight in line with high-end mechanical groups. The downsides are few and far between, limited mostly to ergonomic preferences and, of course, cost. Meanwhile, in Italy, the tinkering minds at Campagnolo had been working to bring electronics to their bicycle transmission since before Mavic’s strikeouts were ever introduced: Campagnolo EPS is the fruit of a development cycle that began in 1992. The Italians’ exorbitantly priced but exquisitely beautiful EPS groups are not without the company’s trademark quirkiness — understanding an arbitrary series of timed button pushes and colored blinking lights is required simply to adjust the group — but the performance still matches and, sometimes, exceeds the brilliance of Di2. Front shifting is similarly powerful and the 11-speed rear derailleur offers outrageous levels of precision, just as Di2 does, but Campagnolo went with a similar button feel and hood ergonomics to its regular mechanical groups. That means a firmer click, more affirmative in response than the rather soft Di2 buttons, and the ability to dump an entire cassette worth of gears with a single, prolonged push. Given the introduction of less expensive electronic options in Campagnolo’s Athena EPS and Shimano’s Ultegra Di2, with even cheaper options on the way, there is no question that battery-powered shifting has dismissed its checkered past. Even though there will be a place for mechanical groups for a long time to come, electronic is the future. For that, we can thank the early inspiration, early tinkering, and early mistakes made by those who came before. When Shimano, followed in rapid succession by FSA and SRAM, came out with its first integrated-spindle crankset with external bearings, it took the bike industry by storm and put countless small crank makers out of business. But it was not the first such revolution. A decade prior, Craig Edwards (now of EE Cycleworks) had come out with his integrated-spindle Sweet Wings cranks, which had an external bearing threaded cup on the non-drive side and a more standard cartridge-bearing cup on the drive side. The Sweet Wings also anticipated Campagnolo’s Ultra-Torque cranks, because, like those, it had a section of spindle integrated into each arm that bolted together in the middle. Sweet Wings also preceded the SRAM GXP design and featured a shoulder on the spindle, which indexed from the inboard side of the bearing to fix the lateral position of the crankarm. That is merely one example of how we’ve seen almost every crank and bottom bracket design before, at one time or another. The Look ZED is perhaps the most futuristic crank these days, with two arms and 50mm-diameter spindle made into a single piece. The system is analogous, however, to the Ashtabula one-piece cranks that people 55 and older all had on their first bikes. The only things unique about the French system may be dimensional: the 65mm inside diameter (I.D.) of the bottom bracket shell, adjustability to three different crank lengths, and the spider arms that have both compact 110mm and standard 130mm bolt circle diameters (BCD). Threadless bottom brackets with press-in bearings are now the norm on high-end bikes, but they have appeared over and over in the past. The Ashtabula is one example, using loose-ball bearings, as are the more recent bottom brackets from the 1980s utilizing cartridge bearings and snap-rings found on some Fat Chance, Klein, Fisher, Ritchey, and Merlin bikes. Many different thread diameters, pitches, and directions have been tried over the years. Last year 650b wheels rolled to victory in the cross-country World Cup and the world championships, and were second at the Olympics, all under Swiss superstar Nino Schurter. In less than two years they’ve gone from relative obscurity to forging a substantial presence in the upcoming catalogs of a vast array of bike brands. They are unquestionably the next big thing on the dirt. Humorously, though, they’re a bit smaller than the last Big Thing — about an inch and a half smaller in diameter. The 650b, or 27.5-inch, or simply 27, depending on who you ask, (we like 27.5) is being touted as the Goldilocks of wheel sizes. While the 26-inch is often a bit too small, 29-inch can sometimes be too large. Perhaps 27.5 will be just right. But this is not their first rodeo. Defined as having a bead seat diameter of 584mm, the origin of 27.5 is a bit hard to pin down. First, just like 700C tires and rims, you won’t find anything on a “650b” tire or rim measuring that number. Traditionally it has been known as 26-inch x 1.5-inch. While rejected by traditionalists, the 27.5-inch designation serves the purpose of clarifying that it lies between 26-inch and 29-inch mountain bike tires in diameter. Since we’re never likely to use the most accurate 559mm, 584mm, and 622mm designations for the actual bead-seat diameters for these wheel sizes, we might as well adopt a system that’s clear— we’re calling it 27.5. In the 1960s and ’70s, 27.5 was the traditional size in France for loaded touring bikes, general utility bikes, and tandems. Super Champion churned out rims in that size, and Michelin built tough, 27.5 tires with a deep, road-touring tread. Nokian made winter tires called Hakkapeliitta in that size, including studded ones that were used for racing bikes on frozen lakes in Finland in the 1970s. Gary Fisher imported Hakkapeliittas for a period in the early 1980s, and he, Tom Ritchey, and some other builders made mountain bikes around them — like the one pictured at left. 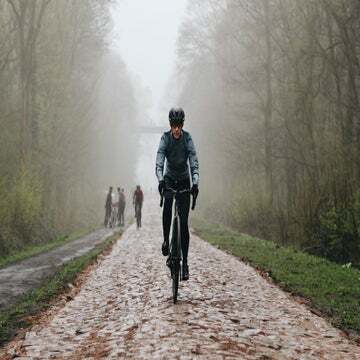 Lack of further availability of the Nokians killed that early effort, and the wide acceptance of mountain bikes with 26-inch wheels killed their traditional uses in France. Kirk Pacenti, an American frame builder and bicycle designer, almost singlehandedly resurrected the 27.5 wheel size by being a determined evangelist for it. He had 27.5 tires and rims made with his brand and ceaselessly urged bike manufacturers to try them. Over the past 18 months, 27.5 has spread like wildfire through the industry, largely due to the fear — on the part of many bike manufacturers — that they’ll find themselves off the back again by not moving quickly enough to the new size. Many of these manufacturers (and their retailers and distributors) were stuck with inventory of 26ers when they failed to adopt 29ers rapidly enough; they don’t want that to happen again. Instead, bike shops now have to stock bikes, tires, wheels, and forks in all of three sizes. The 29er itself took years to take hold, even with the urging of industry giants like Gary Fisher. The change came squarely from consumers, who slowly began to demand the bigger wheels, while the latest middle size is being pushed by manufacturers and brands keen on staying out ahead. It’s almost mind-boggling how quickly the bicycling industry has made available all things 27.5 It was many decades before the real adoption of tubular mountain bike tires in the 26-inch size, despite the best efforts of Vittoria and Fisher decades ago. Tubulars of the 29er variety came around within a handful of years after wide adoption of that size. But, in that case, equipment to roll the rims already existed, as the size is the same as 700C road tubulars; the rims just needed to be wider. 27.5 tubulars, however, appeared almost instantaneously with the appearance of bikes built for that size. This time, we can all enjoy the second (or is it third?) coming of the 27.5 wheel size, due to the dizzying array of extremely high-quality bikes, tires, and wheels being made. Reformed 26er riders can roll a bit faster, and converts from 29ers can have lighter bikes that handle more nimbly and fit small riders better. Could it be a win-win situation? Flowing quickly through the woods, you want nothing more than to carry speed over the crest of the next hill and rip through the descent, to hold onto every bit of momentum through the upcoming plummet, carve the next few corners on rails and blow over that last rock garden that always seemed too steep. The thought of slowing down — let alone stopping — to lower your saddle is out of the question. Momentum is the name of the game. It’s why you bought the latest in trail technology, including the one component every dirt rider should have mounted by now: the dropper post. As soon as bikes began to migrate off road, riders came across a now-familiar problem: when the trail gets steep, twisty, or technical, a saddle high enough for efficient pedaling suddenly becomes a health hazard. Joe Breeze came at the problem from a practical standpoint in the 1980s. He took the equipment everybody was using — round posts and quick release binders — and developed a handy device for repeatedly and consistently sliding a saddle down, and returning it to the same position. Though Breeze’s Hite Rite “seat-locating spring” is a far cry from the hydraulic lines and elastomers that characterize the dropper posts we’ve recently come to love, it did the job of getting the saddle out of the way with minimal hassle. The Hite Rite was essentially a spring-loaded seatpost collar, just as much a saddle anti-theft device as a performance component. A pull on the seatpost clamp quick release and application of body weight on the saddle loaded the spring and dropped the seatpost a couple of inches. Pull the quick release again and the saddle returned to your riding height — keeping the saddle centered through the whole range. The Hite Rite took two NORBA national championship titles under Joe Murray in ’84 and ’85, but met its demise not long after. Twenty years later, the idea reappeared in the minds of engineers at Maverick Technologies, developers of the first modern dropper. Crankbrothers later bought and popularized the design as the Joplin. The Hite Rite was certainly not a bad idea, but it was one that arrived long before its time. Today, that idea has re-emerged, and it’s not leaving this time. RockShox Reverb $370: The RockShox Reverb is the only hydraulically-controlled post in our round up, and was the first dropper post to offer hydraulic actuation. Its XLoc remote — the same lever RockShox uses to lock out its forks — has a better lever feel than any other dropper on the market, narrowly beating out the Kronolog’s large lever. The hydraulic hose could be daunting to riders with less mechanical acumen, but assuming you’re not switching around seatposts for different events, the hydraulic lines are more of a barrier to enter the dropper- post game than a nagging problem; it’s a reliable system that requires little to no maintenance. The bleed process will be familiar to anyone who has bled Avid hydraulic disc brakes. The main issue with the Reverb, much as with the Specialized Command Post, is that there is 100mm or 125mm of cable housing flapping about when the post is dropped all the way down. RockShox addressed this issue for some consumers with the internally routed Reverb Stealth, but that post is only compatible with a small number of frames. The Reverb is available in either 100mm or 125mm of travel. Crankbrothers Kronolog $300: Crankbrothers didn’t design the first modern dropper post, but the company did have a big hand in its popularization. The Kronolog launched in early 2012, a maturation of Crankbrothers’ original Joplin, and its adjustability and clean cable routing have quickly earned it a following. The Kronolog’s semi-oval shaft eliminates the saddle rotation issues that have been a persistent problem with dropper posts. The Kronolog has 125mm (4.9 inches) of drop, and can be stopped at any point in its range. For riders with shorter seat heights, it may be more difficult to fit to the stock Kronolog due to a taller overall height, but unlike other dropper posts the max height is adjustable. The cap on the bottom of the post can be removed, and spacers can be inserted to bring the travel down to whatever level is required. Best of all, the cable responsible for activating the post mounts to the immobile lower section, rather than the post head, so dropping the post doesn’t result in a big loop of extra housing. The Kronolog does away with annoying cable slack and the rotational issues of round suspension seals; it accomplishes both while being the most adjustable dropper post on the market. Specialized Command Post Blacklite $275: The Command Post BlackLite is among the least expensive dropper-posts, is easy to maintain, and has a quick and easy learning curve. The Command Post, unlike the other two dropper-posts here, cannot be stopped at any point on its range of drop. Instead, it has three pre-set adjustment heights which Specialized calls climb, cruise, and descend; these seem to be fairly accurate descriptions. Finding the engagement points in the Command Post’s travel does take some getting used to, but quickly becomes second nature. We found ourselves putting the post into the middle (“cruise”) position more often on descents than the “descend” setting. Its in-between height is low enough to provide room to move while still allowing the rider to feel the saddle. Editor’s note: This feature story originally appeared in Velo magazine’s 2013 Buyers Guide.